A long-lost episode of TV's first spy series, written by Rod Serling! Plus three more more hard-to-find mystery shows, unseen since the Golden Age of Television. 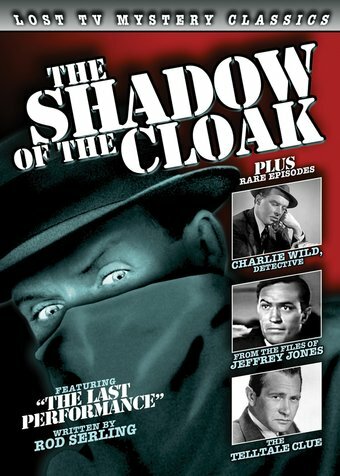 The Shadow of the Cloak 'The Last Performance' (1952): TV's first spy series, The Shadow of the Cloak aired live on the DuMont Television Network from June 1951 to March 1952. It focuses on the exploits of the I.S.I., a counter-intelligence agency "who search out and expose the cloak and dagger operations of agents undermining the peace and security of the world." In 'The Last Performance', a carnival knife-thrower is blackmailed by a communist agent into committing murder. It is written by a pre-Twilight Zone Rod Serling and stars Werner Klemperer (Colonel Klink on Hogan's Heroes). This is the only known episode to exist. Charlie Wild, Private Detective 'The Case of Double Trouble' (1951): Charlie Wild, Private Detective originated on radio, where it was a replacement for the long-running The Adventures of Sam Spade (that program having been dropped by its sponsor after both creator Dashiell Hammett and star Howard Duff were accused of being members of the Communist Party.) On television, it aired on the DuMont Network and was sponsored by Mogen David wine. In 'The Case of the Double Trouble', Charlie is offered $500 to guard a rare parchment, but the trouble that ensues may not be worth the reward. The Files of Jeffrey Jones 'Killer Bait' (1952): For less than a season on CBS, The Files of Jeffrey Jones documented the adventures of an ex-G.I. working his way through law school moonlighting as a Hollywood private eye. In 'Killer Bait', the gumshoe is warned not to help a man accused of murder, but Jones is convinced of his client's innocence. Because they both starred Don Haggerty as a private eye, The Files of Jeffrey Jones is often confused with the earlier series The Cases of Eddie Drake . Director Lew Landers worked for nearly every studio in Hollywood making low-budget thrillers (The Raven, Tokyo Rose ) but by this time had turned his attention to television, later directing popular series like Topper (1953-1955) and Highway Patrol (1955-1959). The Telltale Clue 'The Case of the Talking Garden' (1954): The Telltale Clue was a replacement for Public Defender in the summer of 1954 (CBS moved that Reed Hadley crime drama to Thursday nights to give I Love Lucy a summer break.) It starred Anthony Ross as detective Richard Hale, a criminologist who uses advanced scientific equipment to solve seemingly 'perfect crimes.' In 'The Case of the Talking Garden', a homeless drifter kills the wife of a rich businessman...but the vagrant may not be a stranger to the wealthy couple, despite all appearances. Guest-starring a young Darren McGavin (Mickey Spillane's Mike Hammer , Kolchak: The Night Stalker , A Christmas Story ).